Nicholas W. & William M. Lucas, Jr. The rapid increase in the use of matrix methods for the analysis of structures and the ready availability of electronic computers have revolutionized the field of structural analysis. Although the basic principles underlying the analysis of structures have been well known to engineers for a long time, the development of skill in methods suitable for hand or desk computations has become less important., For example, 20 years ago a typical first course in structural analysis consisted mainly of the analysis of simple structures, often followed by an introduction to the theory of deflections using geometric, energy, and graphical approaches. Such a first course was usually followed by one or more courses dealing with the analysis of more complicated statically indeterminate structures. Almost all analysis was based on linear-elastic behavior. Although many problems could be solved using classical methods such as the slope-deflection method and the method of consistent deformation, for practical purposes graphical and iterative methods such as the moment-distribution method were the structural engineer’s main tools with which to analyze structures. With the development of matrix methods, much of the material comprising the “classical” methods is no longer needed.. However, the laws of equilibrium, compatibility, and force-displacement relationships, including energy principles, that underlie these approaches also form the basis of the more modern matrix analysis methods. It is from this viewpoint—that this text is written. For example it is important for the student of structural analysis to understand the basic methods of truss analysis, but there is no need to develop great skill in such hand- computation methods. Because of the time-consuming character of such classical methods, graphical methods were preferred in practice; these, in turn, required a fair amount of classroom time to develop the necessary skills. The same applies to the analysis of rigid frames. The slope-deflection method could only be used for simple frames, and consequently great emphasis and time had to be spent to develop skills in the use of more practical iterative methods such as moment distribution. In addition, the change in design philosophy from working-stress design to ultimate-strength design has necessitated the inclusion of additional material on the analysis of structures using the ultimate-strength concept. This, coupled with the increased use of nonlinear materials and nonlinear behavior in general, lids forced a drastic reevaluation of the content of engineering courses in the analysis of structures. Many engineering schools started to introduce separate courses in matrix analysis of structures in the early 1960s. Such courses were initially offered mainly at the graduate level, to replace or augment courses in the “classical” analysis of static-indeterminate structures. As the use of matrix methods increased rapidly in professional practice, it soon became mandatory to introduce such methods at the undergraduate level. In spite of this, many engineering schools still feel a need for a basic course in .classical methods to serve as the basis for ‘developing the more sophisticated matrix methods. The main purpose of this text is to provide the student in structural analysis with the basic principles and enough information on the “classical” methods to allow simple hand computation and,. at the same time,. to allow the use of these ,principles as the basis for the development of matrix methods. It contains the basic material for the first two courses in structural analysis at the undergraduate level. 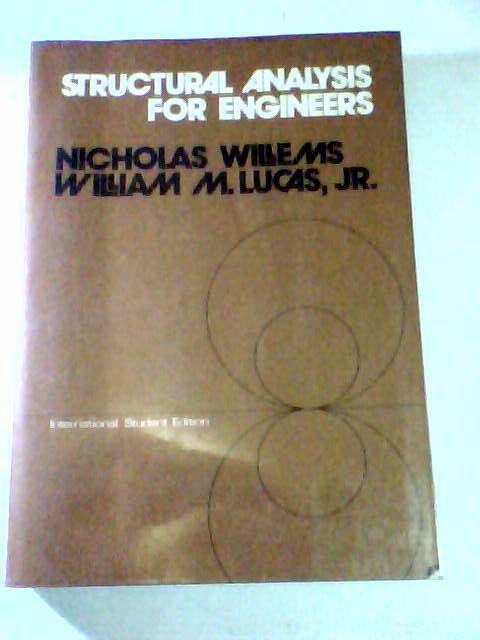 The text includes a chapter on the plastic analysis of structures followed by a general discussion on the analysis of structures which behave nonlinearly. The final chapter introduces the finite-element method as a logical extension of the stiffness method for two- and three-dimensional models. The authors wish to express their appreciation to the School of Engineering and the School of Architecture and Urban Design of the University of Kansas for allowing the time to prepare this book, to Mrs. Betty Lane for supervision of the typing of the manuscript, and to the Computation Center of the University of Kansas for the use of their computer facilities.